Dipping into the sea of beads with the thin needle between my fingers, I scooped up tiny dots of blue, red and yellow, and pushed them down the long thread. Each time, a new pattern of bright colour added to the growing strand in my lap. “That looks good!” said Mama Leah, picking up the end to investigate my work. Layers of beads dripped from her neck and swished softly as she sat down beside me on the dry earth. “You’re almost as good as me,” she said, smiling warmly. Mama Leah is a Maasai and beautifully wrapped in colourful kente cloth. She’s lived her entire life out here on the Maasai Mara in Kenya with her family. We’re sitting under an acacia tree, shaded from the hot Kenyan sun and surrounded by groups of other women, chatting away in Swahili. They too were dipping needles and scooping up beads in a quiet rhythm, their nimble fingers quickly working. We were all making long, beaded chains called rafikis—the Swahili word for friend. It was daily work for these women. They were earning money for the children and families, but more importantly, they were earning a place in their communities. Their voices mattered because they were able to financially support their households and communities. I looked up from my beading, distracted by a herd of bleating goats in the distance. “How many goats do you have, Mama Leah?” I asked. “About 75 now,” she replied. Herding goats is a way of life in the Maasai Mara region, and thanks to her earnings, Mama Leah had a herd all her own, providing milk for her family or to sell at the market. Without beading, she wouldn’t be able to afford such a large herd. “How do you care for so many?” I asked. “My children help. After they’re finished school, they help me a lot,” she said proudly. “What do you do after school?” she asked me. I thought for a second—it didn’t seem as interesting. For an instant, I thought about what it would be like to tend to a herd of goats back home in my parents very small backyard. It was so different here. I felt so far removed from back home, where traffic jams instead of zebra were a common sight. But I also felt in a way, that I was home. People were friendly and kind and always saying “Jambo!” as they waved to me. And then there was Mama Leah—she was just so sweet and I couldn’t stop staring at all the jewellery she was wearing. I wondered how long it had taken her to bead every strand. I loved this connection between mother and daughter. Beading rafikis was a way for women to spend time together and connect through a beautiful tradition. It was an activity that allowed them to share their love and deepen their bonds. I thought about all the times my own mother taught me things, like how to tie my shoes or bake cookies. Rafikis and all of Mama Leah’s intricate beadwork were real symbols of love. “Does your daughter wear beaded jewelry, like you do?” I asked. “She must think of you all the time when she wears it,” said Mama Leah. I smiled and looked around the group of women surrounding us. Some looked very young in Western-style t-shirts, while the older women wore fully traditional outfits. There must have been generations of mothers and daughters. And then, it suddenly occurred to me that as women, we were all the same. We all worked hard to support our families and enjoyed simply being in the company of friends. “Are these women all friends of yours, Mama Leah, or do you know them as co-workers?” I asked her. “Oh I know most of them from when I was little,” she replied. 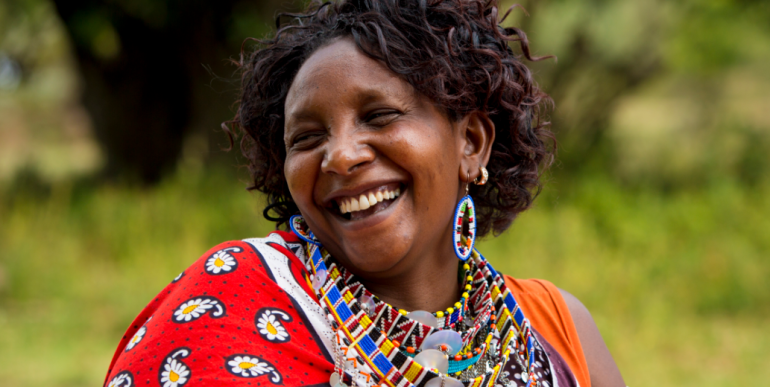 “We are all Maasai Mamas and it’s fun to work together. My children go to school with Mama Helen, over there,” she said, pointing to another smiling woman wearing a kente cloth skirt. “What would you say it’s like to be a woman here, Mama Leah?” I asked, searching her kind face. She paused and scanned the group of women sitting beneath the acacia tree with us. Beads were scattered amongst the grass and some of the chatter had turned to singing traditional Swahili songs. “I would definitely enjoy beading outside with all my friends,” I said. She giggled as she grabbed my arm. “Yes, it is fun!” she added. I couldn’t imagine that kind of life. The women before me were happy and they seemed…almost carefree. It amazed me to see how beading could make such a significant impact on their daily life. In that moment, I decided I had to learn more about women’s projects and what I could do to support them. “I’m so happy you could share your beading skills with me, Mama Leah,” I said. It was true—I had the chance to meet Mama Leah on this trip and even if I had chosen a different country, a different time, our paths would have never crossed. That night, I laid in my tent with my rafiki wrapped around my wrist. As I rubbed the beads between my fingers, I thought about Mama Leah. “Empowered” was a term I never used before to talk about myself and yet, she had made me feel that I too, was part of something. I was an empowered woman. And I wanted to help more women like Mama Leah feel the exact same way.